Buffy the Vampire Slayer Season 2 Episode 3 is an important episode for the series. Several characters were introduced, backstory was revealed, and the show lightly teased the plot for Buffy the Vampire Slayer Season 3. We got a lot in one hour. And it's a lot of fun to rewatch. Don't believe me? Well, then let's rewatch "School Hard" to show you why. 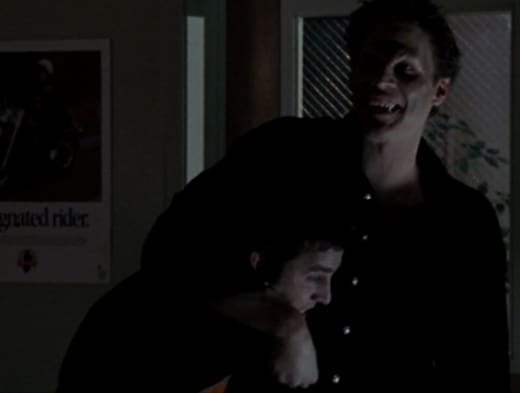 Principal Snyder had a major bias against Buffy. I know many of you love him, but I still hate him. He rubs me the wrong way every time. When I originally watched Buffy the Vampire Slayer, I always thought Principal Snyder was targeting Buffy because of someone else. I waited for it to be on the Mayor's orders. His self-satisfaction at tormenting her was too earnest. He simply just hates her. 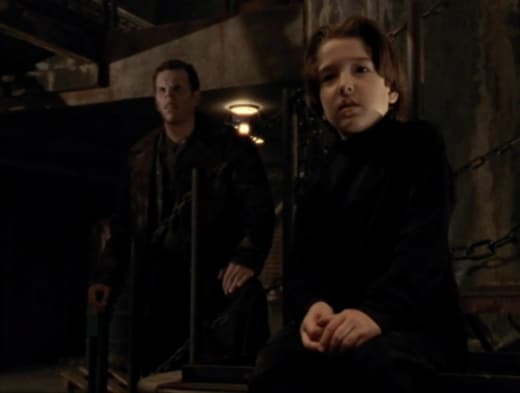 His move in forcing her to help Sheila was another item on the long list of him torturing Buffy. Also, whatever happened to Sheila? She became a vampire and disappeared. Can we take a minute to bask in the perfection that is Spike's and Drusilla's introductions? 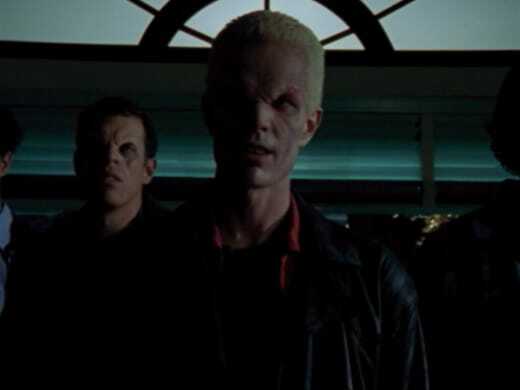 Everything about them heading into town made their arrival on Buffy the Vampire Slayer Season 2 Episode 3 so iconic. They didn't only show up for a fight. It was like a celebration for the fun yet to come. I love rewatching them together on my TV screen. Xander can jinx bad luck anytime he wants. Especially if it means these two would return. Xander: It’s no biggie. You’ll have a nice soiree, the parents will love you. As long as nothing really bad happens between now and then, you'll be fine. Buffy: Are you crazy? What did you say that for? Now something bad is gonna happen. Xander: What do you mean? Nothing's gonna happen. Willow: Not until some dummy says, "As long as nothing bad happens." Buffy: It's the ultimate jinx. Willow: What were you thinking? Or were you even thinking at all? Xander: What, you guys don’t know. Maybe this time it’ll be different? Permalink: Not until some dummy says, "As long as nothing bad happens." Between Evil Spike and Drusilla, I like Drusilla better. There's something about her that is a mix of whimsy and terrifying. Almost like the creepy little girl characters in horror movies. While Spike was brash and dangerous, Drusilla was the real evil threat. I get excited when I hear the twinkling sounds. When you hear the noise it means Drusilla was near. And when she's near, she's either going to mention a premonition or do something unpredictable. Drusilla: Do you like daisies? I plant them, but they always die. Everything I put in the ground withers and dies. Spike, I’m cold. Permalink: Do you like daisies? I plant them, but they always die. Just look at the way she fed on Spike's passion! Juliet Landau and James Marsters are perfection together. It's shame we don't get any ongoing relationship scenes with them after Buffy the Vampire Slayer Season 2, except for flashbacks and random guest spots. Wasted opportunity! Spike: Me and Dru...we're moving in. Now, any of you wanna test who's got the biggest wrinklies around here, step on up. I'll do your Slayer for you. But you keep your flunkies from trying anything behind my back. Deal? Drusilla: I can't see her. The Slayer. I can't see. It's dark where she is. Kill her. Kill her, Spike. Kill her for me? Drusilla: Kill her for princess? Spike: I'll chop her into messes. Drusilla: You are my sweet. My little Spike. Permalink: Me and Dru...we're moving in. 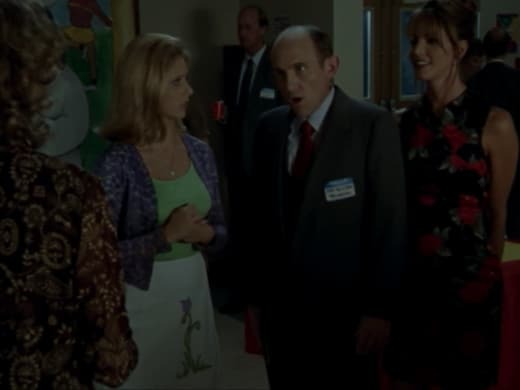 Giles should really have a calendar on-hand indicating important massacre/ritual dates. This seemed like a miss on the part of The Watcher. Why was he so unprepared? Watching him and Jenny panic reminds me of Buffy the Vampire Slayer Season 1 Episode 5 and Buffy the Vampire Slayer Season 1 Episode 12. They have no evidence of what's coming next. Rumors and online chatter are arguably their best resource. The Watchers's Council gives them no help in their time of need. I question their importance in Buffy's life. Like, shouldn't Giles be inundated with prophecies and information in case a well-known day is coming up? I forgot Spike met the Scoobies outside of The Bronze. For some reason I thought it was in a more exciting way. This was pretty subtle in comparison to his arrival in Sunnydale. The way he met Sheila, on the other hand, was fun. Toying with his prey is something the character of Spike would do for the hell of it. He likes having a good time with his kill, and keeping them on their toes. And Sheila didn't know what to expect at all when the bad boy came around. As I've already mentioned above, Drusilla is still the scariest. I don't know about the rest of you, but if I ended up in that creepy doll room, I would be freaking out. We're venturing into horror movie territory here. Drusilla talking to Lady Edith was the nail on the coffin for me. Did Joyce only talk with Snyder at parent-teacher night? Willow showed her around the school, but we only saw her being pulled in by Snyder. When I was a kid, I was curious about this. Others could've talked about Buffy in a positive light and gave a good word to her mother. Buffy seemed to get along with her other teachers; Snyder was the only one who hated her. If it were my kid and Snyder was eager to meet me to complain, I would be cautious. He looks like he has an agenda to fulfill. Though, that could be because I don't like him. I already know he's evil. Spike taking over the school: risky but smart or reckless plan? Sure, in hindsight we know he fails in his goal, but let's focus on the idea itself. Should he have done this? I don't think so. The element of surprise works in most scenarios. In fact, it's one of the most common tactics we see in movies and TV shows. It keeps people on their toes, which is very Spike. The downside here is that Buffy's home base (the library) is in Sunnydale High. He attacked her in the place which has all her weapons! All she needed to do was get to the library. It was not a smart move. I love Buffy and Joyce's relationship development during "School Hard." Joyce gets to see her daughter in full Slayer-mode for the first time. All the leadership qualities, the organizational skills and the bravery comes right out during the intense battle. Buffy is at her best when taking charge. Buffy the Vampire Slayer Season 2 Episode 3 is an essential episode because it is the first time Joyce starts seeing her daughter as a strong person instead of a rebellious delinquent. Joyce has had her character issues in the past. Especially all the passive-aggressive shady words she's thrown at Buffy. And she does it again by mentioning moving to Sunnydale because of Buffy's past. It's great to see her trust her daughter for once. There's a continuity error between Angel and Spike. You have to really listen to it to pick up on the mistake. In fact, it's a pretty big one to the Whendonverse. Spikes calls Angel his sire. Angel is not Spike's sire. Drusilla is Spike's sire. It should go Darla, Angel, Drusilla and then Spike (with Darla once again later on). This could simply be an early thought before they changed it later on. I've rewatched Buffy the Vampire Slayer (and the spin-off Angel) many times already; I pick up on this error whenever I hear it. Who else laughed while Cordelia and Willow were trapped in the closet together? They're the friendship I think needed more scenes. And yes, I am aware of what happens to them on Buffy the Vampire Slayer Season 3, but they complement each other nicely. I would love to see a sitcom with these two together. Willow is confident enough to tell Cordelia off if she's being ridiculous. She's no longer the wallflower from Buffy the Vampire Slayer Season 1 Episode 1. As I mentioned in the rewatch for Buffy the Vampire Slayer Season 1 Episode 5, the Anointed One was the most pointless character. He did NOTHING. His biggest contribution was leading Buffy to meet The Master. And even then he did nothing else since. I'm not surprised he got killed off early. A vampire child Big Bad sounds like a good idea in theory; it has all the makings of a threat for the Slayer. However, age is their biggest weakness. Spike did us all a favor by ending the Anointed One and shaking up the tone of the series. Thank you. Spike: How's the Annoying One? Drusilla: He doesn't wanna play. Spike: Figures. Well, suppose I better go make nice. The Anointed One: You failed. Vampire: Penance? You should lay down your life! Our numbers are depleted. The feast of St. Vigeous has been ruined by your impatience! Spike: Let's see what's on TV. Permalink: Let's see what's on TV. What did you think of "School Hard"? Were you a fan of Spike and Drusilla right from the beginning? Why didn't Joyce notice the vampire faces? Want to join us in rewatching Buffy the Vampire Slayer? We'll be posting new rewatch posts every Tuesday and Thursday. Come back here and share your thoughts of the episode.